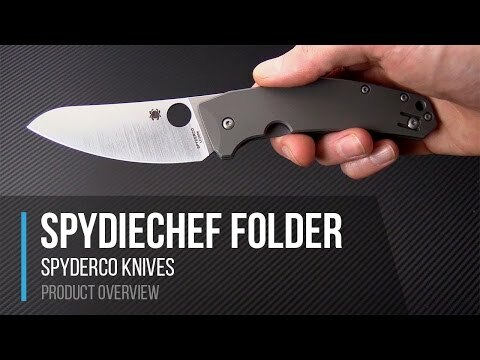 The SpydieChef has been added to the Salt Series of ultra corrosion resistant knives that are available from Spyderco. This new do it all folder incorporates the friendly ergonomics of a good chef's knife into a everyday carry folder. 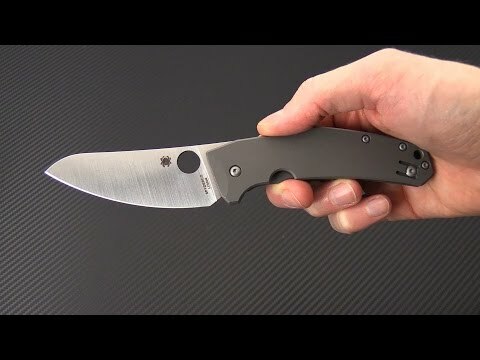 CQI: In the quest for Constant Quality Improvement Spyderco has updated the SpydieChef with a ceramic detent ball for added corrosion resistance and smooth operation. The Blade: Based on Marcin Slysz' custom design, this sheepsfoot style blade has a full flat grind crafted made from ultra rust resistant steel. The blade edge extends lower than the handle for elegant graceful cutting. The Handle: Reeve Integral Lock frame is made from dark tumbled titanium with open back construction. A relief cut into the top frame offers quick access to the thumb hole for deployment and easy access to the lock-bar when in the open position. Finishing touches include a reversible deep carry wire pocket clip and built-in lined lanyard hole offer convenient carry options. LC200N is a high nitrogen alloyed tool steel which exhibits superior corrosion resistance combined with high toughness even at hardness up to 60 HRc. The steel has excellent machinability and polishability while maintaining its dimensional stability after heat treatment.